African Americans make up a larger share of the electorate in Mississippi than they do in any other state, and in recent days Mike Espy and groups backing him have flooded the state with volunteers, radio ads and social- media posts. JACKSON, Miss. — Democrats have unleashed an extraordinary effort to energize African-American voters in Tuesday’s Senate runoff, seeking to turn anger over racially charged comments by incumbent Sen. Cindy Hyde-Smith into a surge of black turnout large enough to lead to a major political upset. The Democratic candidate, Mike Espy, faces steep odds as he seeks to become the first black senator from deeply conservative Mississippi since just after the Civil War. The state’s long struggle with racism has emerged as an unavoidable theme, with two nooses found outside the state Capitol on Monday morning. But African Americans make up a larger share of the electorate here than they do in any other state, and in recent days Espy and groups backing him have flooded the state with volunteers, radio ads and social-media posts — seeking out potential voters in churches and on historically black college campuses. “We’re talking to folks who haven’t been talked to in years,” said Ray Sykes, a Democratic leader in Coahoma County, where Espy got nearly 70 percent more votes in the Nov. 6 election that preceded Tuesday’s runoff than the Democratic nominee four years ago. The runoff comes in the aftermath of other elections this year in which black candidates in Florida and Georgia energized minority voters but narrowly lost after enduring racially charged attacks. 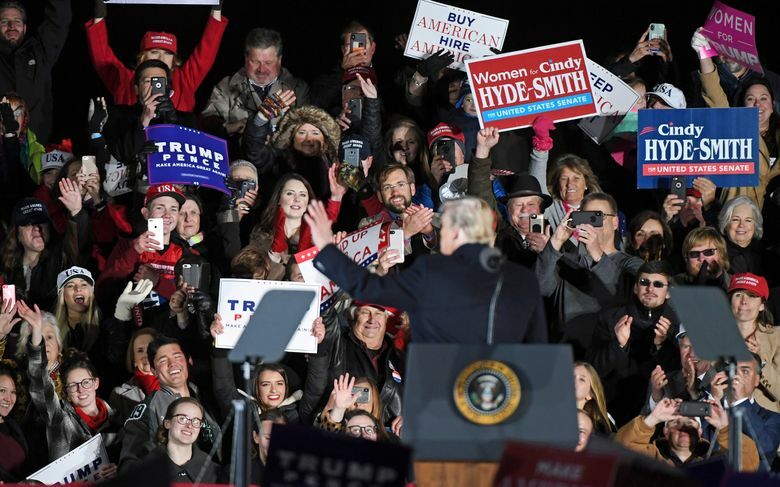 GOP anxiety has grown in recent days over the possibility of losing a Senate seat here for the first time in 36 years, prompting President Donald Trump to visit the state Monday night for twin rallies. Trump’s first rally was in Tupelo, where Hyde-Smith this month said she would sit with a supporter in the front row of a public hanging. The comment resurrected memories of the state’s dark racist past and has become one of the most dominant themes of the short runoff election. It also prompted additional scrutiny of Hyde-Smith’s record of defending the state’s Confederate past. But the president on Monday sought to portray Espy as the one who is out of step with modern-day Mississippi. Espy and Hyde-Smith, who would be the state’s first elected female senator, are vying for the seat that was long held by Sen. Thad Cochran. He resigned in April because of health issues, and Republican Gov. Phil Bryant appointed Hyde-Smith to fill the seat. Whoever wins the election will fill the last two years of Cochran’s term, and then have to run again in 2020. A runoff is required because no candidate got 50 percent on Nov. 6. Hyde-Smith and another Republican, Chris McDaniel, had won a combined 58 percent, compared with Espy’s 42 percent. A Hyde-Smith win Tuesday would hand Republicans a 53-47 Senate majority — representing a net gain in this year’s elections of two seats. Hyde-Smith has done little to quell the outrage over her public-hanging comments, offering a conditional apology during a debate last week and largely avoiding the issue even as several corporations — including Walmart, Google, Major League Baseball, and AT&T — have asked her campaign to return their contributions. The comments have become a focal point for Espy and his supporters. Orlando Paden, a state legislator who represents rural parts of Coahoma County, recalled a conversation with his 94-year-old aunt, who said that the comment reminded her, right away, of the scourge of lynching. Peter Stewart, a 52-year-old volunteer who was traveling on a bus with a national group called Black Votes Matter, said that the comments had been “embarrassing” to all Mississippians, but galvanizing for black voters. Awareness of the election had surged since then, he argued. Black Democrats have been reaching voters through a combination of canvassing, social media messaging and direct contact at churches. Hyde-Smith in recent days has held a handful of public events, but largely avoided answering questions from reporters and has a strategy that is focused on hugging Trump as tightly as possible.